Major Robert Swearingen will be inducted into the Honorable Order of St. Christopher at the UGPTI Annual Awards Banquet Oct. 16. Swearingen graduated from the NDSU MML program in 2012 and recently returned to NDSU to pursue a PhD in Transportation and Logistics with a research fellowship from UGPTI. In 1998, the Army's Chief of Transportation approved the Military Order of Saint Christopher to recognize individuals who have made significant contributions to the U.S. Army Transportation Corps. The award is named for St. Christopher, the patron saint of the Transportation Corps Regiment. The Honorable Order of Saint Christopher recognizes those individuals who have demonstrated the highest standards of integrity and moral character; displayed an outstanding degree of professional competence; and served the Transportation Corps with selflessness. Individuals whose actions and service contributed to the promotion of the Transportation Corps in ways that stand out in the eyes of the recipient's superiors, subordinates and peers. Swearingen recently retired from the U.S. Army after more than 25 years of military service. 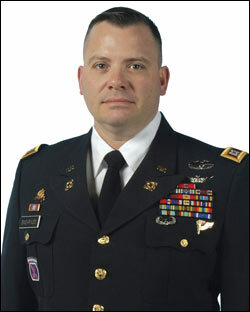 His military career includes numerous accomplishments and innovations in military logistics. He revolutionized the process for loading helicopters aboard ships by reconfiguring the hoist sling attachments and modifying cargo crane operations. During the deployment of troops from South Korea in support of Operation Iraqi Freedom in 2004, his team implemented protocols to improve equipment accountability, staging area throughput and situational awareness. He provided command and control for more than 50 combat convoys in the Baghdad area in two months and later personally led 27 combat convoys in the infamous "triangle of death." Swearingen led more than 250 personnel in convoy operations in support of cadet training at West Point. In Mosul, Iraq, Swearingen coordinated regional and theater efforts including support for national elections, unit deployment management, and the closure of more than 40 bases with associated removal of material in support of the draw down. Most recently he was course director for the sustainment and logistics pre-command courses for battalion and brigade commanders at the Army Logistics University at Fort Lee.